We’ve heard many discoveries over the past decade of planets around other stars. Today astronomers announced the detection of seven new comets around other stars. You can read more here: “Exocomets may be as common as exoplanets”. Why should we care? Well, comets are a lot smaller than planets, so it’s impressive that they can be detected at all. Even more impressive, these discoveries were made with a 2.1-m telescope on the ground, not in space. You might be wondering how exactly they were detected if it’s so hard even to find Earth-sized planets. That’s because these comets aren’t being detected directly, e.g., by the brief drop in stellar brightness when a planet transits in front of it. Instead, what’s actually being detected are slight perturbations (lasting about 5 days) to the star’s spectrum across multiple wavelengths, which indicates a compositional difference. Since we don’t expect the star to briefly change its composition and then revert back, this is interpreted as seeing gases boiling off the comet as it passes close to the sun. If so, I’d expect that the particular changes would serve as a kind of “fingerprint” for that particular comet, and be somewhat repeatable the next time it approaches its star. But comet periods can be a lot longer than planet periods (at least in our solar system) so it might take a while to get any repeat signals. The scientific reason this is interesting is that it can serve to fill in a gap in our knowledge. We’ve seen systems with dusty disks surrounding the star (before planets form), and we’ve seen more mature systems with their planets already formed. We haven’t yet explored the in-between stage in which a lot of material (comets, asteroids) is moving around in the process of forming into large planetesimals. 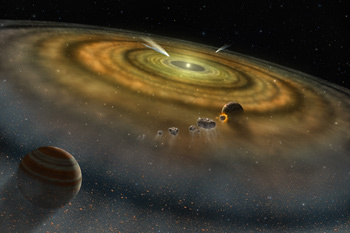 For that reason, astronomers targeted young (type A) stars for the exocomet hunt. Further, turns out that the technique used wouldn’t work with older/cooler stars. In discoverer Barry Welsh’s talk today at the AAS meeting (he’s giving a press conference tomorrow), he noted that the spectral absorption features they think come from comet outgassing get “narrower and harder to detect in older stars.” I’m not sure of the specifics on this, but it suggests we won’t be able to find exocomets in all of the stars we’ve been studying… at least this way. Astronomers’ innovations will continue to push the envelope!